It is not always easy to know all the lingo, especially when you’re new to a particular hobby. In board gaming, people throw around terms like Alpha Gamer, Analysis Paralysis, Beer and Pretzels, or Worker Placement, all of which make perfect sense to long-time gamers, but can be a bit confusing to new comers. For this week’s CMON Feature Friday, we continue to pull back the mystique surrounding some popular board game terms. As always, we’re interested in hearing from you. Let us know which terms you’d like defined and we’ll do our best to bring them to you in the future. If you’ve played games like Dungeons & Dragons or Massive Darkness, then you’ve played some forms of Dungeon Crawlers. In this genre of games, players often work together to navigate their way through a series of labyrinthine tunnels in search of treasure and glory. 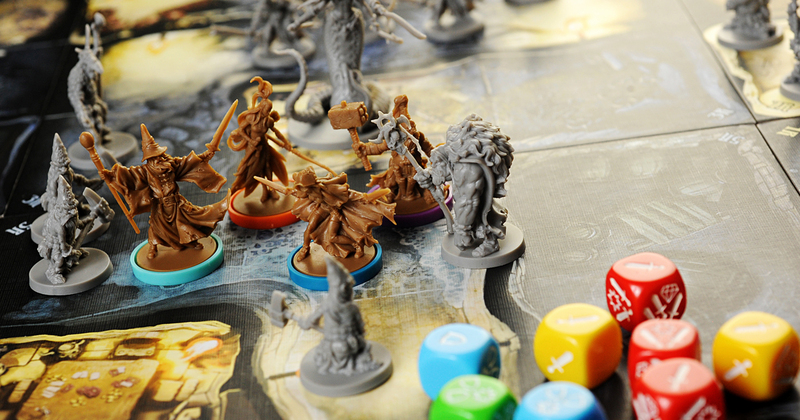 Often, Dungeon Crawlers will feature miniature figures to help the players better visualize their environment and situation. Traditionally, a Game Master will oversee the proceedings and lead players through different confrontations with underground mobs of creatures, various traps, and rooms full of gold. Over time, new systems have been created, eliminating the need for an all-knowing GM, and allowing all the players to work together to accomplish their goals. Typically, Dungeon Crawls take place in a fantasy setting, full of dwarves, barbarians, wizards, and monsters, but more and more, games are taking the mechanics and rulesets of these games and plunking them into different worlds. It wouldn’t be uncommon now to see a game set in the future, or outer space, that took advantage of a Dungeon Crawler-like set of rules. It begs the question: is it the setting or type of game that makes it a Dungeon Crawler? A Perfect Information Game (which I will refer to as a PIG from now on, because it’s a hilarious acronym) is a game where all of the information can be known at any time. On a very basic level, a game like Chess would be a good example of a PIG. Some people would take it to another level and require a PIG to contain no random elements in them, such as a shuffled deck of cards or rolled dice. Any random factors that couldn’t be predicted would take away the PIG label from a game. There is a certain appeal to a game that is completely deterministic. Players are forced to square off against the instincts, intellect, and creativity of their opponents. Some people enjoy some random elements in their gaming, but if you like to control all the parts of a game (except for your opponent’s decisions, of course), look for a PIG. When we get home with a new game, rip off the packaging, and open the box for the first time, it represents limitless potential. This game could be our new favorite, the title we go to every time someone in our gaming group looks at us and says, ‘What do you want to play?’ Over time, the excitement to play some games will inevitably fade. They become solved, or repetitious, or just not fun anymore. However, some games retain their ability to delight and entertain, even after multiple plays. Maybe the theme is particularly rewarding, or there is a variety of strategies to explore, or the rounds are quick. Whatever the reason is, whenever someone suggests it, you’re happy to get that game to the table. This is the Replay Value of a game. An excellent selling point to a game is having high Replay Value. It gives you the sense that you’re going to get multiple plays of the game and really get your money’s worth. Don’t get me wrong, there are tons of great games out there that you can only play once, but a game that is re-playable over and over again is a valuable thing to have in your collection. Just keep in mind that what you see as being re-playable may not be what your gaming friends do. Try and find a game that meets everyone’s tastes. So, there you have it. Three more board gaming terms defined. Let us know what you think with the hashtag #CMONFeatureFriday.